These carrot fritters have been a surprising hit. I confess, I didn't expect it, since I don’t much like cooked carrot, but this isn't the usual cooked carrot and the sweetness of the vegetable and the mix of spices, cheese and lemon rind in the recipe I made, the one popular with Turkish and Kurdish Jews, turned out to be simply delicious. It might also have something to do with the fact that I am finally getting better at frying! Until this project came along, I hadn't really made fritters, but after four weeks of frying I am finally getting the hang of it. What the grandmothers know from years of experience, I've been learning by trial and error. At the start of this project, I watched the grandmothers cook and wrote down their recipes (since what they say and what they do are often quite different!) and I thought that that was enough, and now I knew how to do it too . That's me photographing every step of Esther Givoni preparing a chocolate yeast cake with her grand-daughter in her home on a kibbutz in the north of Israel. But does that mean I will make a cake as good as Esther's? It’s only when you try it yourself that you realise what experts the grandmothers are. Someone posted this article/radio story about star chef Yotam Ottolenghi on my Facebook page, just as I was writing this. He says the success of his cookbooks is down to how much testing he does. The other aspect which he stresses, and I am only slowly learning, is the importance of precision. Even the shape of the pan can make a difference! I'm more slapdash by nature, used to adding a bit of this and a bit of that, and usually getting away with it. This project is helping me to deal with this – ummm – character flaw? So here’s what I’ve learnt. For frying, temperature matters. So does how much oil you use and how large your fritters are and how long you leave them. The oil should be hot when you put in the fritters, but not too hot. Keep it at medium when you fry. The fritters should be largish and not cook for too long. That way they won’t come out too oily, or too dark. This version is popular with Turkish and Kurdish Jews. Feta cheese and lemon rind give it character. I used fresh mint, as well as parsley, and that was a good addition. Otherwise, it’s an excellent way to sneak vegetables past suspicious children, as well as being delicious for adults. 1. Grate the carrots in a food processor and mix with the onions, herbs, spices, lemon zest and feta. Add the flour, baking powder and eggs. The mixture should be firm enough to hold together. Add a tablespoon of flour if it’s not. 2. Heat oil for deep frying. If you are using a shallow pan, and not a deep fryer, shape the mixture into oval patties, 1.5 cm thick and large enough to cover your palm. Cook over medium heat, about 3-4 mins each side. 3. When they are golden, but not dark brown, remove and drain on paper towels. Best served hot. 4. You can also make them more like nuggets, if you use a deep fryer, and drop in spoonfuls of the mixture. Cook for 1 minute if you like them soft inside, or longer, up to 3 minutes, for a crispier version, which will be firm all the way through. You should be able to make 16 of these smaller ones. One more piece of good news. These are quick. Grating in the food processor is easy (and easy to clean), there’s no need to cook the carrots or drain the liquid from them after grating. The whole thing can be done in 20 minutes. We have a new test cook today – working in her kitchen in Madrid! Candice Hughes is a reporter who, like me, was posted to both Moscow and Jerusalem. Unlike me, she speaks Spanish and is now based in Spain with her husband, Richard, also a foreign correspondent. She served her fritters hot, with a tomato salad garnished with mint and dill and a bean salad. Instead of the yoghurt sauce Candice chose a light, creamy fresh Spanish cheese, which was "a good counterpoint." So that's a thumbs up from Madrid. “First off, they were easy. Second, they were really tasty. Third, I might even make them again. The bar for fried food in my health- and weight-conscious house is pretty high. It's got to be worth the calories. And these were. My chief taster, Richard, said they were "excluding desserts, the best carrot dish I've ever eaten." In Sydney, Miyuki Mane took a different tack, going Korean! 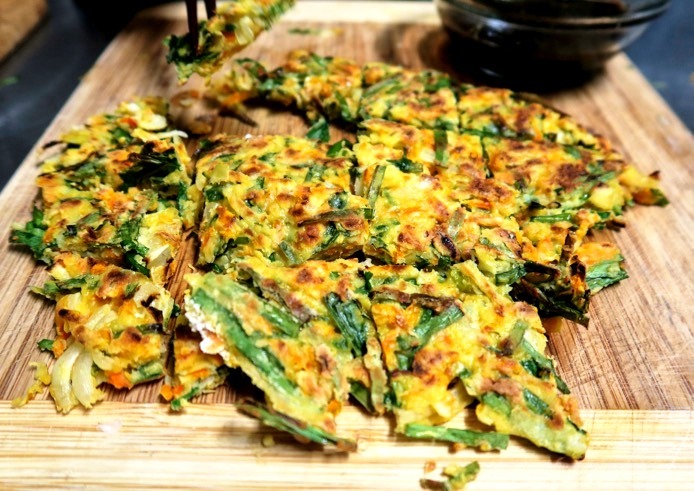 Chijimi are large omelette size pancakes with carrots, garlic chives, prepared with a water based batter. You cut them up to serve. The garlic chives are the most important ingredient, which give the dish its distinctive taste. “Without garlic chives, Chijimi is not authentic,” says Miyuki. 1. Put all the chopped vegetables into a bowl. 2. Add water, chicken stock, egg and salt, and mix. Then add flour and mix well. 3. Heat frying pan. Add sesame oil and tilt till it covers the whole pan. You don’t need much. The more sesame oil you use, the crispier the chijimi will be. 4.. Pour 1/4 - 1/3 of the batter into your prepared pan, spread thinly and cook over medium-low heat. In effect, you are making 3 or 4 omlettes which you will cut up afterwards. 5. Cook for 10-12 minutes, and when it’s brown, flip it over and cook the other side until vegetables are completely cooked - another 3-4 minutes on this side. Add more sesame oil if required. 6. While chijimi is cooking, mix the ingredient for the dipping sauce and put aside. 7. Cut chijimi into the size you want on the chopping board and serve with dipping sauce. In Melbourne, Uschi Schwartz made fritters with sweet potato, instead of carrot, but she didn't use orange sweet potatoes, she found purple ones! She made them for the Jewish festival of Shavuot, which she celebrated with her mother-in-law, Baba Schwartz, who is one of our Food is Love grandmothers. Like many Hungarian women, Baba is an expert cook, and a superb baker. She has even written a book on baking with yeast. (We will be lucky enough to have some of her recipes in later blog posts, as well as her extraordinary story of surviving World War Two.) Baba usually prepares food with the tastes and spices she knows from Hungary. As there was no purple sweet potato in Budapest, she's left this dish to Uschi. 1. Scrub sweet potato well and leave the skin on. 3. Finely slice the onion. You can also use the mandolin for this. Uschi’s note: I used a Japanese mandolin but realised that my setting was a little too thick so I par boiled the slices in salted water, which worked out really well. Good mistake. It removed the starch and produced a nice dry mixture to work with. 4. Par boil the sweet potato slices in salted water for 2 minutes, and drain. When the sweet potatoe has cooled a little, mix it with the raw onion. Squeeze out any excess moisture by wringing in a tea towel. Mixture should be quite dry. 5. Add egg, potato flour, chopped chives and salt pepper and mix well. Fry large spoonfuls in hot olive oil, drain and sprinkle with sea salt. Verdict: This recipe’s a keeper. Good with orange or purple sweet potatoes, crispy, more like rosti than latkes and completely delicious. Next week: Matbuha – tomatoes cooked slowly and served cold as a salad. This dish originated in North Africa's Jewish communities, and is now a staple on many Israeli dinner tables. Newer PostTomatoes. A love story.